On this day in history, 22nd June 1528, Mary Boleyn lost her husband, William Carey, in the sweating sickness epidemic which swept through the English court and London in May and June 1528. Mary’s sister Anne, her brother George, and her father Thomas also caught the disease but fortunately recovered. “”Laud be Jesu, the King’s grace is very merry since he came to this house, for there was none fell sick of the sweat since he came hither, and ever after dinner he shoth (shooteth ?) to supper time. This morning is told me that Mistress Ann and my lord of Roxfort had the sweat, and was past the danger thereof.” Mr. Carre (Carey) begs you to be gracious to his sister, a nun in Wilton Abbey, to be prioress there, according to your promise. Mr. Tuke is here, and lies in the court under the King’s privy chamber, so that he may come at the King’s pleasure. At every meal the King sends him a dish from his table. The King will tarry here 14 days. Hunsdon, 23 June. Mary and Carey had been married since 4th February 1520 and had two children, Catherine and Henry, born in 1524 and 1526 respectively. Carey’s death left Mary in dire financial straits and she ended up writing to the king for help. 1535 – The execution of John Fisher, Bishop of Rochester, for treason after he refused to take the Oath of Succession and accept Henry as the Supreme Head of the Church of England. Click here to read more about his fall and execution. 1536 – Henry VIII’s eldest daughter, Mary, finally submitted to her father and accepted her father as Supreme Head of the Church in England and the invalidity of her parents’ marriage. Click here to read more. 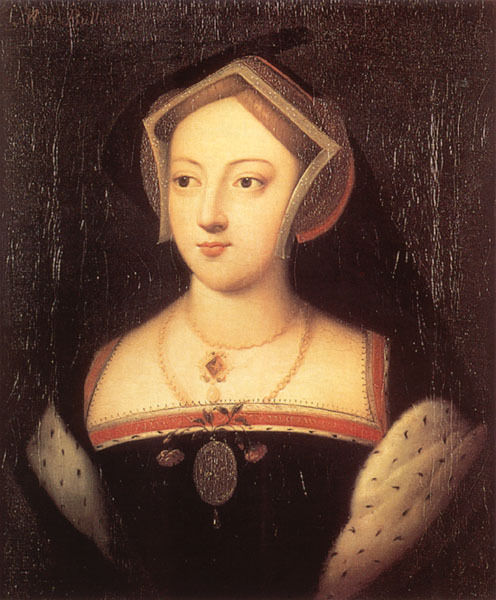 Picture: Portrait of an unknown woman, possibly Mary Boleyn. ‘Henry VIII: June 1528, 21-30’, in Letters and Papers, Foreign and Domestic, Henry VIII, Volume 4, 1524-1530, ed. J S Brewer (London, 1875), pp. 1929-1947. British History Online http://www.british-history.ac.uk/letters-papers-hen8/vol4/pp1929-1947, 4408. Poor Mary had lost her young and handsome husband and was left with two young children to support, apart from the grief she must have felt at losing her partner she also had to contend with worrying about her financial affairs, I think she was very lucky she had a sister who was queen and she was able to get the support she needed, but she had to ask the King for help in securing assistance from her father, I’m not sure but to me Thomas Boleyn seems a bit of a skin flint or could be he was just careful with money, years later when Mary was in another tight spot after eloping with her second husband without the King or queens consent he downright refused to help her out, obviously he was furious with her but Anne was the one who sent her a bag of money later not her father, Thomas in these two instances seems a bit mean spirited, the sweating sickness sounds like a truly horrible disease, with the sweating and aching and bad headaches it resembles the flu, I’m wondering if it was a strain of flu which has now long died out, one of the odd things about it was the fact that rarely foreigners caught it, just the English, if any foreigner did catch it they seemed to be able to shake it off a lot quicker and rarely died, Mary had been married for just eight years and her children were two and four, it’s safe to say that Henry Carey couldnt have had any memory of his father and Catherine only vague memories, there has been a lot of debate about whether Henry V111 was their father but I feel it’s highly unlikely at least in Henrys case, people often commented that Henry looked like the King yet Carey was a relative of his so a family resemblance can be explained, in Weirs book of Mary Boleyn she points out that Catherine showed a marked resemblance to the King and if she was his daughter it would explain the grants he gave to William Carey, as we don’t know when their affair ended, it’s difficult to determine a date that would give credence to the idea she was the Kings daughter, when Elizabeth Blount fell pregnant she was married of and sent to the country where she gave birth to her son, so maybe it’s just court gossip that thinks the same happened with Mary, she too was married to an eligible suitor who happened to be a favourite of the King and maybe this was the reason he was chosen? Was Henry sure of his silence? I’m sure Henry either would not have proclaimed Catherine as his as what would be the point of telling everyone he had fathered just another useless girl, she grew up to be Elizabeth 1’s dearly beloved cousin and she married and had a very large family, if she was Henrys then she at least was lucky in that she did not fertility problems, but then many believe that it was not Henrys genes at fault for the miscarriages his wives had or the dead infants but some fault with them, it is said that Katherines rigorous fasting during pregnancy did not help and Anne could have been rhesus negative, while Henry if he was rhesus positive would explain the miscarriages she endured, my cousin and his wife both possess the rhesus blood group and were advised not to have any children as she would not be able to carry it to term, so sadly they were unable to have the family they wanted, after Carey’s death Mary was back at court for some time though possibly not in a permanent position as I doubt she would have wanted to leave her daughter for long and little Henry was being well looked after, having an excellent education, Anne and her brother had both had a good education and Anne was determined that her nephew would not go wanting, Mary must have been with her sister when she gave birth to Elizabeth although they are not recorded as being particularly close, but blood is thicker than water and she would surely have wanted her with her then and there are rumours she was at court when Anne had a pregnancy the outcome of which remains a mystery, she could have suffered a miscarriage then and wanted it kept a secret, she could trust her sister, unlike most of the spiteful court women and the loud mouthed Lady Rochford, their sister in law, Mary appeared to enjoy a happy existence at court when her husband was alive and after she must have led a relatively quiet life, apart from being in attendance on her sister, no doubt she grieved for Carey his portrait is of a cheerful looking handsome man and she could have loved him, in any case he had been her protector and now she had to beg from the King, her former lover for help from her father, when she married again she was in disgrace but happy she had found a man who loved her as she did him, she died before he did however and there are rumours of a child but there is none on record, the dreadful sweating sickness shows just how fragile human life was back then, today there would have been a vaccine no doubt and the terrifying speed it killed someone was enough to make Henry V111 quake in his boots, imagine waking up in the morning having your porridge, then sitting down to dine several hours later feeling ok, then by say six pm feeling a bit hot and bothered, some having to go to bed and it was advised to wrap yourself in blankets with the window shut, no fresh air allowed in because of the pestilence, so you just had to lie there in the most unbearable pain sweating and wanting to drink again and again, I reckon I would have thrown the blankets of and opened the windows, if I had been rich I would have drunk myself silly on wine and if I was going to die then so be it, now I no that’s easy for me to say but no way could I have gone to bed feeling excessively hot and make myself hotter by cocooning myself in towels and blankets, especially if it was a summers day, and sometimes people just got a headache and just collapsed in the street dead, then it strangely disappeared and there was an outbreak apparently in France a few centuries later or it was presumed to be the sweat, those who survived were extremely lucky, and it left many families devasted. She married a Stafford without the King’s consent, don’t have his name here, but he was a relative of mine. I am a descendent of the Dukes of Buckingham. Henry was upset to lose a good friend and Mary Boleyn was left with two young children and debts when William Carey died of the Sweating Sickness in 1528. Mary was left a widow, without support due to her husband’s reckless gambling. Anne stepped in and the guardianship of her two children was granted to her for a time, thanks to the King, while Mary sought assistance to gain some relief from her jointure. Mary lost her legal status, her partner, her handsome husband who gave her some protection, was in favour at court, but she also lost out financially due to his gaming. As a widow, Mary was apparently the target of gossip and nastiness and felt she could not find a suitable husband. Back at court, in her sister’s service, Mary blossomed again and met a man who cared for her, no matter what. William Stafford was a minor member of the powerful Stafford family, who were related to the late Dukes of Buckingham, who had a small fortune and holding, but who could only offer a modest income. Mary didn’t care. She fell in love and wanted the peaceful life he offered in the country. The marriage went ahead without the permission of Anne, now as the Queen, or her father, to whom she owed a duty as his daughter of obedience, but Mary didn’t appear to get any of this and was surprised to be banished when she came to court six months later, heavily pregnant. This was the first time her family knew about Mary’s second marriage, so of course, their reaction can be seen in that light. Mary was forced to write a very humble letter to her father and Cromwell who intervened before Thomas Boleyn relented and gave her an income. She would need Cromwell to intervene again after her father’s death to gain her inheritance.